Seeing a show in London’s West End was near the top of our list of things to do on our visit. Originally, we planned on getting tickets from Leicester Square’s Half Price Ticket Booth. We even started planning our sightseeing itinerary around being able to be near Leicester Square when the booth opened at 9am. I had a great memory of snagging front row tickets to Les Misérables for half price when visiting in 2003, and wanted to relive the experience with my wife. Luckily, I did enough research before leaving to know that half-price tickets for Les Mis are no longer easy to come by. For visitors to London less particular about the show they see, the Half Price booth is a great option. The booth now posts the list of most of it’s offerings online, including shows available for the next 2 days. Not all of the shows are “half price”, but decent discounts are sometimes available for even popular shows (tickets to Jersey Boys 33% off at the time of writing this post). The seats available at Leicester Square are likely less desirable, but many of the theaters in the West End are fairly small with very few bad seats. If you do buy ahead, however, do some quick research to try and get the best seat possible. Similar to popular website Seat Guru (used for selecting airline seats), Theatre Monkey provides information on the best seats for many of London’s theaters. We ultimately decided to buy Les Mis tickets in the Orchestra section and Theatre Monkey was a great resource for choosing our seats. It’s surprising how different pricing can be for seats that appear to be the same on a map, often due to an obstructed view that may not otherwise be intuitive. We decided to be close to the action, so we bought tickets for the front row, but avoided the ends of the row since Theatre Monkey identified them as bad seats. Interestingly, front row seats are often significantly cheaper than seats a few rows back in the Orchestra section, due to the view being less than ideal. We had absolutely no issues with our view, however, and I believe we enjoyed the show much more than we would have from the Upper Circle and we were able to save a bit of money. We decided to follow Les Mis with dinner at YO! Sushi (a franchise restaurant in the UK), because of a happy hour on Monday nights discounting all sushi to £2.49 and their 11pm closing time. We were dismayed to find the restaurant totally empty upon arrival after the show. We were informed the kitchen was closed and we were relegated to eating whatever was leftover on the sushi belt. After sampling what was available, we were very disappointed in the quality (on par with supermarket sushi in California) and we cut our losses and quickly left. Back out on the main streets, we explored for an alternative but didn’t find anything that fit the bill. Later on in our trip, we realized we just didn’t look hard enough that night, as there are actually plenty of options for late night dining in the West End, including some that actually offer a “Theatre Menu”. Several nights later we enjoyed one of our best italian meals ever (especially outside Italy), at Bocca Di Lupo, which does offer post-theatre dining. This restaurant, like many other good ones, is just not on the main streets we explored that night. With a little research and patience, we learned, it would be possible to enjoy a nice dinner after the theatre. For a successful West End experience, either book ahead for a specific show or wait until the last minute and choose from the available shows at the half-price ticket booth. 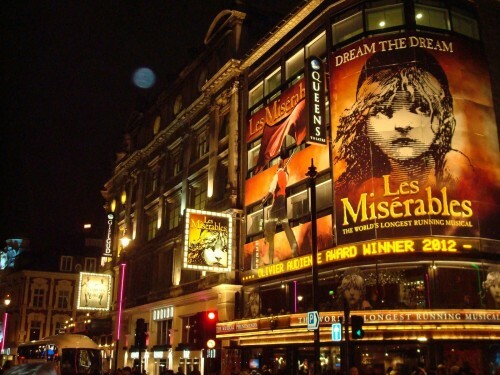 Even though we booked ahead for Les Mis, it is certainly possible to see shows on the West End with much less planning. Next time, we might try getting half price tickets the same day and use the savings for a fancy post-theatre dinner! This entry was posted in Entertainment, Things To Do, Travel and tagged Europe, London, strategy, travel planning, UK by Ryan. Bookmark the permalink.